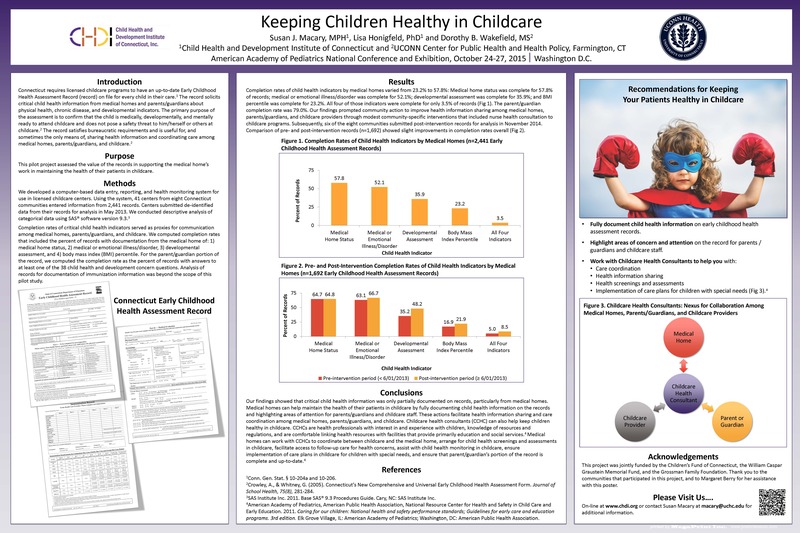 Click here for the poster presentation on the results of CHDI's Early Childhood Health Data Initiative at the annual American Academy of Pediatrics National Conference & Exhibition. Information sharing among child health providers, parents/guardians, and early care and education (ECE) providers ensures optimal health outcomes for young children in ECE settings. Local and state early childhood planning and policy development also benefit from sharing aggregate information about children’s health. Although community-level health information for young children exists in Connecticut, it is neither easily accessible nor very useful in its current form. Findings from the second phase of our work showed slight improvements in the completion rate of the parent/guardian and pediatric provider portions of the record. The results will inform future work to strengthen the connection between child health and ECE to ensure optimal health outcomes for young children in settings where they receive services. The Early Childhood Health Data Initiative was coordinated by the Child Health and Development Institute from 2013-2014 and jointly funded by the Children’s Fund of Connecticut, the William Caspar Graustein Memorial Fund and the Grossman Family Foundation. Contact us to learn more.